Just to the east of the Fort William Henry Hotel‘s Premium Wing is the Fort William Henry Museum and Restoration. This popular attraction has entertained and educated several thousand tourists and locals since the 1950s. The restored fort is located on the site of the original fort which played a major role in the French and Indian War in the mid-1750s. Its log construction is painstakingly maintained on a yearly basis and archaeological work continues to unearth buttons and bullets from the fort’s time as well as tools from earlier Native American settlements at the site. The fort has always featured guides dressed in period uniforms. However, the upcoming 2013 season will feature an effort to create more of a living history experience, in a similar vein as Colonial Williamsburg and Mount Vernon. 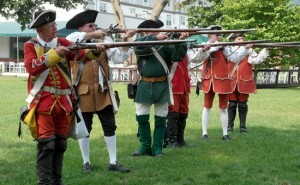 As part of that effort, there will be two encampments featuring re-enactors from all over the Northeast region. The first will be in mid-August with a smaller one in mid-September. Other scheduled improvements include updates to many of the displays, including the Underwater Archaeology on Lake George exhibit which opened last year with the help of Joe Zarzynski and John Farrell from Bateaux Below. The popular Ghost Tour will also be improved and expanded. This family-friendly tour by candlelight takes place evenings during the summer. The fort and surrounding grounds are popular with paranormal enthusiasts and it was featured in an episode of Ghost Hunters on the SyFy Channel. Put the Fort William Henry Museum and Restoration on your list of Things to Do in Lake George. Don’t get caught on thin ice! Fireworks – No better spot to see them!